What Day Of The Week Was August 8, 2011? 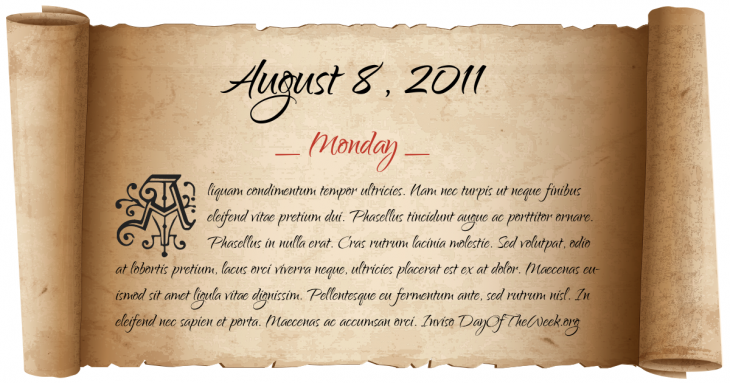 August 8, 2011 was the 220th day of the year 2011 in the Gregorian calendar. There were 145 days remaining until the end of the year. The day of the week was Monday. A person born on this day will be 7 years old today. If that same person saved a Cent every day starting at age 5, then by now that person has accumulated $9.85 today. London Riot 2011. This took place between 6th August 2011 and 10th August 2011. between the 6th and 7th a peaceful march in Tottenham, London was followed by rioting and looting, first in Tottenham.